The Broncos have fallen quite a ways from their Super Bowl 50 win about two years ago. The team’s biggest question mark is obviously at quarterback, but there are a number of questions that John Elway and company will have to answer over the course of the offseason, explains Nicki Jhabvala of the Denver Post. Jhabvala mentions that the Broncos wide receiver position could really change over the next few months depending on how the front office approaches some of the playmakers that could enter free agency. The big name she mentions is Demaryius Thomas who could test the open market should Denver decline his $4MM option. He’s controllable for non-guaranteed salaries for the next two seasons, but the team could save some money or re-negotiate a new contract before a decision has to be made about that option. In addition to Thomas, Cody Latimer is an unrestricted free agent, Bennie Fowler is a restricted free agent and Emmanuel Sanders is a controllable veteran that could hit the trade block if the team rather invest in Thomas long-term. Jhabvala also focuses on veteran cornerback Aqib Talib. She notes how he’ll turn 32 in February and is set to make $11MM in 2018. Although, the Broncos would only be responsible for $1MM if he were to be released. With Chris Harris and Bradley Roby under contract as well, it’s unlikely the team would hold onto all three for next season. The article finally keys in on Denver’s starting running back, C.J. Anderson. Anderson is paid well for his position as he’ll make $4.4MM next season. However, his last two years of his original four-year deal that he signed in 2016 are non-guaranteed, so there is definitely significant money to be saved should the team move onto the likes of Devontae Booker, De’Angelo Henderson or potentially a another running back that they draft in April. Denver has to deal with an off-the-field problem at receiver as well. Their 2017 third-round draft pick, Carlos Henderson, was arrested this afternoon for possession of marijuana, per Brad Cesak of NBC6News (Twitter link). The 23-year-old was placed on the injured reserve with a thumb injury in the preseason, but could face league discipline for his most recent incident. This would be his first offense, but it’s not encouraging for a Broncos team potentially looking for steady contributors on that side of the ball. The news that Pete Carroll would be replacing Darrell Bevell with Brian Schottenheimer as Seattle’s next offensive coordinator was met with some skepticism across the football world. However, Seahawks backup quarterback Austin Davis thinks that the change will bring some positivity to the team’s offense in 2018, reports Brady Henderson of ESPN.com. Schottenheimer coached Davis for three seasons while the two were in St. Louis. “We were very creative in St. Louis,” Davis told 710 ESPN Seattle. “We threw a lot of things at the defense, whether it was drop-back, whether it was play-action, whether it was quarterback movement, we had it all. And we were a really good screen team. If there was one thing I could pick out from last year, we couldn’t run screens.” The Seahawks offense was carried by Russell Wilson last season and is in need of a new identity as the team looks to get back into the postseason. 49ers promising rookie linebacker Reuben Foster recently got in trouble with the law for having possession of marijuana, which is likely to effect his paycheck in the years to come. The 2017 first-round pick had about $2.5MM in guaranteed money from 2018-2020, but that will probably be voided because of specific wording in his contract, according to Joel Corry of CBS Sports (Twitter link). Corry explained that Foster had a clause in his contract that if he were to be fined for a violation of the NFL’s drug policy, that money would lose its guaranteed status. The former Alabama defender fell down the draft board a bit last year because of some personality issues, and his immaturity has now clearly cost him in terms of his wallet. Current 49ers starting quarterback Jimmy Garoppolo made some extra cash after the Patriots beat the Titans to advance to the AFC Championship, according to Corry in another tweet. Corry reports that Garoppolo received an extra $51k in playoff money for the victory because he was with New England for at least eight games this past regular season. Adrian Peterson is the Cardinals‘ latest David Johnson replacement solution, but interestingly, a potential Peterson-to-Arizona path was discussed two years ago. The running back’s agent, Ben Dogra, contacted Cardinals GM Steve Keim during the first round of the 2015 draft and told Peterson to work friend Larry Fitzgerald about a possible trade to Arizona, Tom Pelissero of NFL.com reports. Peterson was then a disgruntled Vikings employee, lobbying for more guaranteed money — which he eventually received. But the Cardinals drafted Johnson a night later in the third round, and the Vikings ended up redoing Peterson’s contract. Peterson went on to lead the NFL in rushing with 1,485 yards that season en route to his fifth All-Pro first team appearance. The Cardinals then went with Chris Johnson before David Johnson took over late in that 13-3 campaign. Peterson said earlier this week upon being traded to the Cards he did want a change of scenery from a Saints setup that wasn’t working for him but added he didn’t request a trade. The 32-year-old back is now Arizona’s starter, and the future Hall of Famer will be tasked with turning around a Cardinals rushing attack that’s been by far the worst in the league. Here’s the latest from some Western-division teams. On the subject of what-if trades, it appears a rumor emerged involving the Cowboys being linked to Broncos running back Devontae Booker is unfounded. Both the Denver Post’s Nicki Jhabvala and 9News’ Mike Klis shot down this talk (Twitter links), Jhabvala going as far as saying a deal involving the second-year back is “not even a remote possibility.” Although the Broncos have C.J. Anderson and Jamaal Charles healthy, both have extensive injury histories. Booker does as well but is controlled through 2019 on a rookie deal. 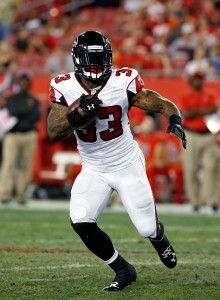 At least two teams were “seriously interested” in a NaVorro Bowman trade, Matt Barrows of the Sacramento Bee reports. But the 49ers, due to his longevity and impact with the team, allowed the 29-year-old linebacker to veto a deal. John Lynch confirmed one team did want Bowman, only the eighth-year ‘backer didn’t want to play for the unnamed franchise. Barrows adds the four-time All-Pro became frustrated by being subbed out during multiple series per game. Branden Albert worked out for the Seahawks this week and was still in the Seattle area as of Friday, but finances may be holding up a deal. While no terms have been reported about a potential Albert/Hawks agreement, the Seahawks may be attempting to save a week’s worth of salary by not signing Albert until the start of next week, Brady Henderson of ESPN.com writes. The Seahawks are off this week. Albert was also scheduled to work out for the Giants, who are having similar offensive line issues, but has yet to do so. Bengals TE Tyler Eifert‘s most recent injury has further clouded his free agent case, as Paul Dehner, Jr. of the Cincinnati Enquirer writes. Eifert, who is in a contract year, is again experiencing back problems, and it is uncertain when he will return to the field. As Dehner observes, the Notre Dame product is in something of a catch-22. He either suits up at less than full health, which could hurt his performance and therefore his next contract, or he could wait until he is 100% healthy but not be on the field at all, thereby reinforcing his injury-prone reputation. Dehner says the franchise tag could still be in play for Cincinnati, as it would come at a relative bargain ($9-10MM) considering Eifert’s ability, but even a one-year deal at that value might be too much for the Bengals to stomach in light of Eifert’s health concerns. He may ultimately have to settle for a one-year “prove-it” deal to reestablish his value in 2018. Julian Edelman underwent surgery to repair his torn right ACL within the past week, as Mike Reiss of ESPN.com writes. Reiss adds that everything went according to plan for the Patriots wideout, who expects to return at full strength in 2018. Jamaal Charles had his best game with the Broncos last week, rushing nine times for 56 yards and a score, and his surprising success, along with the imminent return of Devontae Booker, have created a good problem for the Broncos, as Nicki Jhabvala of the Denver Post writes. Denver OC Mike McCoy said all three of his top backs — C.J. Anderson, Charles, and Booker — will get their fair share of reps, and there will not be a set number of carries for any of them. Ian Rapoport of NFL.com (video link) says Ravens RB Alex Collins will get an increased workload in the team’s contest against the Steelers today. Collins, who was promoted off Baltimore’s taxi squad several weeks ago, has looked like the most explosive back on the roster in his limited reps, so he will get an opportunity to show what he can do in a more featured role. The Jaguars’ questionable offseason decision to pick up quarterback Blake Bortles‘ fifth-year option for 2018 isn’t the first time they’ve exercised “tunnel vision” with a young player, Bill Barnwell of ESPN.com observes. For instance, Barnwell regards the Jags’ call last summer to extend wide receiver Allen Hurns on a four-year, $40.7MM pact as unnecessary, as he was due to make just $600K in 2016 and would have been controllable for a $3.9MM first-round tender as a restricted free agent this season. Hurns went on to post disappointing production last year (35 catches on 76 targets, 477 yards, three touchdowns in 11 games) and is no longer one of the Jaguars’ top two receivers. Barnwell also opines that the five-year, $51.7MM extension the Jaguars handed center Brandon Linder in July isn’t any more appealing than the deal they gave Hurns. As for Bortles, who’s behind uninspiring veteran Chad Henne in the team’s QB derby and could be on the outs if he loses the battle, the Jaguars should have made an effort to find another signal-caller in the offseason if they weren’t entirely sold on him, Barnwell opines. However, instead of courting the likes of Tony Romo, Jay Cutler or Brian Hoyer, among others, they just re-signed Henne. Now, with pickings under center looking especially slim, Barnwell suggests the Jaguars pursue Brock Osweiler if the Browns move on from him. The odds of Colts quarterback Andrew Luck missing the team’s season opener against the Rams on Sept. 10 continue to increase, Mike Wells of ESPN.com writes. Luck, who underwent right shoulder surgery in January, remains on the active/physically unable to perform list with fewer than 10 practices left until Week 1. Head coach Chuck Pagano said Tuesday that there “no timetable” for Luck to return, leaving the team with the less-than-stellar Scott Tolzien as its No. 1 option under center as long as its prized starter is on the shelf. The presence of wide receiver DeVante Parker is among the reasons the Dolphins haven’t gotten serious about a long-term extension for fellow wideout Jarvis Landry, Ian Rapoport of NFL.com tweets. More progress from Parker in 2017, the third season of his career, could mitigate the damage of Landry’s departure. Landry is due to become a free agent after the season, meaning he could exit, though the Dolphins may just place the franchise tag on the slot dynamo if they’re wary of committing to him for the long haul. Parker is under club control for up to three more seasons, depending on whether the Dolphins exercise the 2015 first-round pick’s fifth-year option for 2019, and is coming off a sophomore campaign in which he racked up 56 receptions, 744 yards and four touchdowns. Broncos running back Devontae Booker‘s wrist injury will keep him out for the first two to three weeks of the regular season, head coach Vance Joseph told reporters, including Nick Kosmider of the Denver Post, on Thursday. The team doesn’t believe that’s a long enough absence to justify placing Booker on the reserve/PUP list and losing him for the first six games of the season, so he’ll occupy a spot on the Broncos’ 53-man roster while he’s continuing to recover. That decision could affect their other backs, of course, as C.J. Anderson and Booker may be the only locks at the position. Jamaal Charles is the biggest name in their backfield, and the longtime Chief/recent injury case will see his first preseason action Saturday. Onetime 1,000-yard rusher Stevan Ridley, fourth-year man Juwan Thompson and sixth-round rookie De’Angelo Henderson are also vying for roles. Running back Stevan Ridley worked out for the Broncos on Thursday, Nicki Jhabvala of The Denver Post tweets. The audition comes in the wake of news that Devontae Booker will need minor surgery on his wrist. Booker was unknowingly lifting weights with the injury for weeks and wound up aggravating it in training, a source tells Ian Rapoport of NFL.com (on Twitter). . He is said to be facing a 6-8 week recovery after surgery and although the Broncos expect to have him in the lineup for Week 1, they may want to have their bases covered by adding someone like Ridley. Ridley was hampered by injuries in 2016 and bounced around the league a bit, but it has been said that he’s now mostly healthy. His only other known audition of the offseason came when he worked out for the Jets in May. We’re now years removed from Ridley’s 1,ooo+ yard campaign with the Patriots in 2012. It remains to be seen what he can offer in 2017. No. 36 overall pick Myles Jack has formally signed his rookie contract with the Jaguars, the team announced today. Jack, who was initially viewed as a potential top-10 pick, will be in line for a rookie deal worth $6.334MM, with a $2.807MM signing bonus, according to Over the Cap. The Texans have wrapped up their deal with second-round center Nick Martin, tweets John McClain of the Houston Chronicle. Martin figures to step in for former center Ben Jones, who departed Houston for the division-rival Titans in free agency. The Jets announced today that they’ve officially signed third-round outside linebacker Jordan Jenkins, as Randy Lange of NewYorkJets.com details. That leaves first-round linebacker Darron Lee as the only Gang Green draft pick who remains unsigned. The Bills continue to work backwards through their draftees — after signing their two sixth-round picks, the Bills have now locked up fifth-round running back Jonathan Williams, according to the team’s website. The Broncos now have two more draft picks under contract, signing third-round safety Justin Simmons and fourth-round running back Devontae Booker to their four-year rookie deals, per Troy Renck of the Denver Post (Twitter link). Most NFL teams have at least one representative in attendance at the pro day for Memphis quarterback Paxton Lynch on Wednesday, but the Bills got a closer look at the young signal-caller on Tuesday night, according to Sal Paolantonio of ESPN, who reports that Buffalo took Lynch out for dinner (Twitter link via Mike Rodak). The Bills have a quarterback they like in Tyrod Taylor, but Taylor has just one year remaining on his contract with the team, and an extension is not believed to be close, so it will be interesting to see if Buffalo nabs a QB early in this year’s draft. Offensive coordinator Greg Roman is in Memphis to check out Lynch. We can add Alabama center Ryan Kelly, Ole Miss left tackle Laremy Tunsil, and Oregon defensive lineman DeForest Buckner to the extensive list of pre-draft visitors meeting with the Jaguars today, according to tweets from John Oehser of Jaguars.com and Ryan O’Halloran of the Florida Times-Union. The Broncos remain in the market for running back help, and are hosting Utah RB Devontae Booker for a visit today, a source tells Ian Rapoport of NFL.com (Twitter link). According to Terez A. Paylor of the Kansas City Star (Twitter links), Akron outside linebacker Jatavis Brown, Michigan State cornerback Arjen Colquhoun, and Baylor offensive lineman Blake Muir recently met with the Chiefs, who are hosting UTSA defensive tackle Brian Price for a visit today. UCLA offensive tackle Caleb Benenoch, Florida safety Keanu Neal, Boise State safety Darian Thompson, and Temple cornerback Tavon Young are in Pittsburgh today to visit the Steelers, per Bob Labriola (Twitter link). The Jets met extensively with Utah State linebacker Kyler Fackrell, a potential second-round pick, on Tuesday, according to Tony Pauline of DraftInsider.net, who tweets that Fackrell would fit a “big need” for Gang Green. While the Buccaneers have floated the idea of acquiring a first-round pick for quarterback Mike Glennon, Matt Miller of Bleacher Report hears the Tampa Bay would accept a third-rounder if it were from a team picking relatively high. That conflicts with a recent report by Jason La Canfora of CBSSports.com which said the Bucs turned down a second-round pick for its backup quarterback. Of course, La Canfora’s report didn’t given any sense of a timetable, so Tampa’s view of Glennon’s market could have changed since it rejected a second-rounder. Glennon is generating the most trade interest of any signal-caller outside of Colin Kaepernick, per Miller. Some around the NFL don’t expect Penn State’s Christian Hackenberg to have any chance at being a first-round pick now that the Texans have signed Brock Osweiler, according to Miller. Houston head coach Bill O’Brien tutored Hackenberg at Penn State, but now Hackenberg looks to be a second- or third-round pick. Instead of focusing on quarterback, the Texans could now look to find help at either wide receiver or defensive tackle early in the draft, the clubs’ scouts told Miller. After releasing Mike Wallace earlier this week, the Vikings are expected to target receivers early in the draft, and one player to keep an eye on could be Josh Doctson of TCU, per Miller, as a team source tells the Bleacher Report scribe that Minnesota has a high grade on Horned Frog pass-catcher. Linebacker Reggie Ragland struggled during his Pro Day, and could now possibly fall to the second round. One scout told Miller that the Alabama product looked “slow, sluggish, and heavy” during his workout. Another Alabama defender — defensive tackle A’Shawn Robinson — is viewed as a two-down run-stopper, and therefore might fall out of the first round. Oklahoma cornerback Zack Sanchez is earning good reports from NFL scouts, says Miller, and he’s moved up enough draft boards that he could now be a late first-round pick. Some teams are wary of running back Devontae Booker because the Utah product has undergone two surgeries to clean up a torn meniscus.